"Well I'll be darned. Ain't you the prettiest peach on the farm." Said the gentleman looking for a lady to court. "I'd like to take your hand for a dance, or two." Once upon a time there was a beautiful southern bell. She loved lemonade in the shade, balls to dance the night away at, and the occasional peach picking party. The belle had a packed schedule with all her social events. She never thought about getting hitched because she simply didn't have time. Then he came along. He was handsome with dark features, and donned smooth southern accent. It was romance neither of them have encountered before. Some say both were out of a fairy tale. Others say that true love is a beautiful thing. They lived out there days happily together. A truly enchanting picture perfect love. Everyone would love to live in a fairy tale. Halloween is the closes thing to a fairy tale in reality. 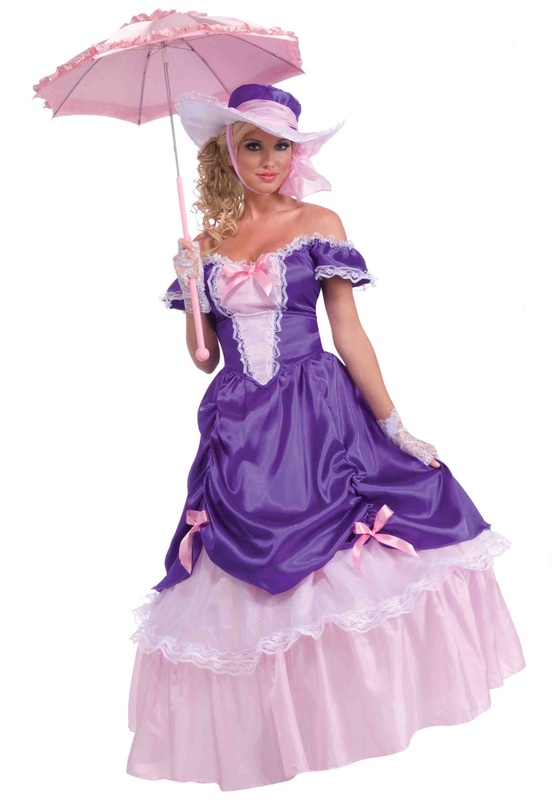 You can be like her in the Blossom Southern Belle Costume. The bodice is purple with a pink center and inset edged with lace. The skirt has overlays of lace edged white knit mesh and purple satin. It includes a southern belle hat that has a wire brim. This costume is also available in child size. Get ready for romance, and to dance the night away at the governor's ball in the Blossom Southern Belle Costume.